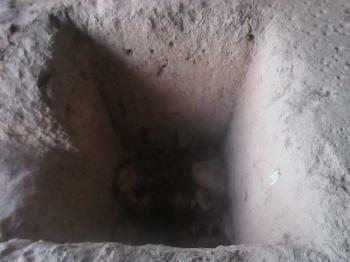 The Archaeological Heritage of the Lenggong Valley are four sites related to early man outside Africa. Palaeolithic workshops and tools have been preserved, abandoned due to meteorite impact and volcanic ash. One human skeleton from that period has been found – known as Perak Man. Visited the multiple sites in January 2019. I was invited by the Lenggong Museum authority to join an expedition on training the local guides. We started from the archaeological museum where the Kota Tampan site is situated. The museum is now reopened after two years of renovation with first floor containing artefacts and the famous Perak Man skeleton. The second floor is more to general information and two suevites with stone axes from Bukit Bunuh, evidence to proof that Lenggong was occupied as early as 1.83 million years ago, the earliest outside Africa. The Kota Tampan site behind the museum was a bit disappointing as the roof that covered the site was being torn down by the monkeys and the site got flooded after the rain. 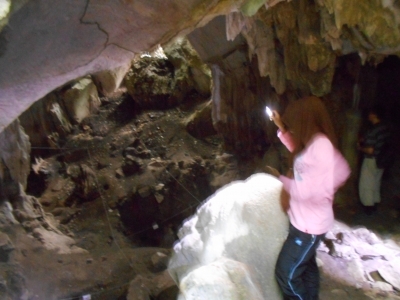 The highlight of the trip was a visit to Gunung Runtuh Cave and Kajang Cave under Bukit Kepala Gajah, situated behind the Kampung (village) Gelok area. One has to walk through a dense forest (now rubber plantation) to reach the bottom of the cave, then hike almost vertically through the sharp limestone to reach the cave. The entrance of the cave is now facilitated with a heavy barred door and patrolled by guards daily. The only way to get in is to approach the museum in advance and they will offer someone to guide you in. Gua Gunung Runtuh is actually quite small, but important to the region because of the finding. It was the place where a 10120 years old male (Perak Man) born with congenital deformity was found. According to research done he was probably a shaman due to the smooth teeth surface (to chew herbs) and the way he was carefully buried in the center of the cave. There are also abundant layers of shells in situ, indicating that he was buried in a grand and respected ceremony. Gua Kajang is 10 minutes drive from Gua Gunung Runtuh. It’s where two female skeletons were found at the entrance of the cave. We also visited Bukit Sapi, situated at the roadside, where the 74000 years old volcanic ash of the Mount Toba (Sumatra, Indonesia) eruption could be found. It’s a white wall with some part being excavated. There’s a signboard introducing the incident. Gua Badak was the final place that we visited (didn’t get to visit Gua Harimau just next to it due to time). The mural painting on the cave wall was relatively new compare to the environment. One is because it’s drawn with charcoal, the other one is because there’s a CAR with tyres on it. So it’s probably done by the indigenous people here not more than a hundred years ago. Does it worth a visit? It’s very interesting if you’re interested at archaeology and anthropology. But you’ll be looking only at caves and stones if you didn’t any professional guide to bring you around. My suggestion is to contact the museum in advance (tengah@heritage.gov.my) and mention my name Michael and they will know what you’re looking for. As a recent visitor throughout the Malaysian mainland, I wished to visit the WHS of the Lenggong Valley! This site is not really difficult to find but it seems that most of the guide books ignore this place or allocate to it few lines with fewer details! More surprisingly most people around seem to even not know the existence of a WHS nearby & its interest! One must say that the site of the Museum is not accurate, especially for the date of completion of lengthy renovation works! I finally found a taxi driver who seems to know the area! (he was very interested by the visit & told us afterwards he will return with his children!). With my travel companion, we arrived at the Museum which was closed... after some chat between our taxi driver & the entrance guard we were introduced to a very nice guy who appeared to be one staff member! He accepted to bring us inside & visit some parts of the Museum! He gave us precious information about the place : In some Lenggong Valley caves were discovered elements proving human life spanning over 2 million years & records of early men, the oldest outside the African continent! Most interestingly there is the skeleton of the Perak Man, the oldest most complete human skeleton (probably more than 10 000 years old!). This souvenir of this man is soulful as he was probably handicapped with one of his arm so he probably had to struggle even more than his counterparts for surviving in his very hostile environment! At the end the visit to Lenggong is very interesting but the Malaysian Cultural Authorities have to dedicate more efforts in order to ease the visitor experience to this rather unknown WHS. Just visited (March, 2016). Not an easy site to visit but not very difficult either. The whole site consist of two clusters located on both sides of Lenggong town, some 30 km north of Kuala Kangsar (KK). From KK bus station there are frequent public buses to Lenggong town (first at 6.00 am, from 8 am to 6 pm every hour and the last one is at 7.30 pm). It arrives to Lenggong after 30-40 minutes. In Lenggong there are no taxis nor tuk-tuks so if you want to see the places around you can either walk or find someone with a car. 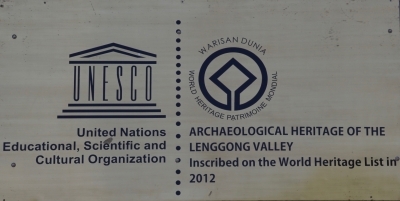 Lenggong Valley archeological sites consist of 2 clusters - to the south of Lenggong town, around 7 km - Archeological Museum, Cluster 1 - Bukit Bunuh, Kota Tampan) and three caves (Cluster 2), located north of Lenggong. For Archeological Museum (ask the bus driver to drop at the junction) you should leave the bus at Kampung Baru Kota Tampan from where there is around 1,5 km to the museum. The whole area around museum together with a viewing platform are within boundaries of Cluster 1, Bukit Bunuh. In fact the whole are is covered by palm trees - no signs of excavations are visible. Cluster 2 (at least Bukit Kepala Gajat part is clearly visible from Lenggong town) is accessible from the town - no marked trails. 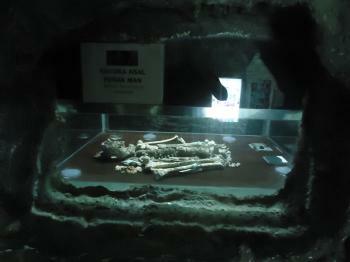 The highlight of the museum, the skeletal remains of Perak Man, was anticlimactic. He lied serenely, protected from the curious observer in a transparent case, instead of being portrayed in interesting postures like a dinosaur rearing his head. There was however an entertaining display of the identity card offered to our Perak Man, an evidence of him being a Malaysian citizen. Outside of the museum building was a lone observatory tower on a low hill. It will worth your time to climb up. The lush foliage stretched as far as the eye could see, broken only by the hills to the horizon and the snaking river cutting a path across. With the clouds rolling past lazily after a light shower, the scenery was calm and soothing. It was by far the best reason I could give to anyone who ask why they should be here. The archaeological importance of the site is unquestionable. My favorite site is view of the valley from the observation tower - the lush vegetation, the Perak River and the mountains on two sides. It is understandable why prehistoric communities found a home here. The Perak State government however needs to develop transportation to and from Lenggong. It is a difficult site to visit; and the irregular bus system in Peninsular Malaysia does not help. 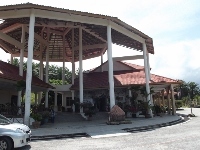 Driving on Malaysian highway from George Town to Lenggong was very easy and I arrived safely at the Lenggong Archaeological Museum within just 1.45 hours. After read negative reports on this website, I did not expect much from the visit, the nearby beautiful Kuala Kangsar’s royal quarter and Belum-Temengor forests were substitutes to make this trip more worthwhile, at least the latter may become a World Heritage Site in the future as a trans-boundaries forest with Thailand. The only thing I could see when I reached Lenggong area was the palm oil plantation and the museum itself is located in the middle of plantation. The museum is quite small in the L-shaped complex, one side of the building is the empty hall and the other is the permanent museum. The exhibition is quite fine; on the ground floor, there are artifacts like ancient axes and hunting weapons as well as archeologists’ excavation tools and their stories. The signboards about Asian archeological sites on early hominid places have interesting information about Southeast Asia as a second important on early hominid study outside Africa. 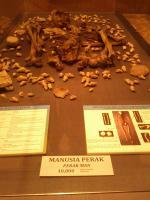 The highlight in the museum is the Perak Man, the oldest complete human skeleton remains in Southeast Asia. These authentic remains have been moved from Kuala Lumpur last year to heighten archeological values of Lenggong. 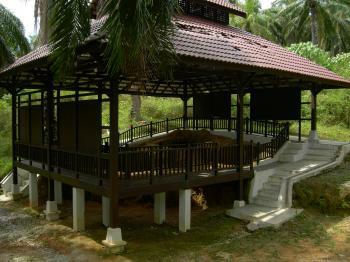 The museum even replicates the cave where Perak Man discovered. The last section of exhibition is on the second floor with story of its World Heritage campaign, and the UNESCO certificate. My personal favorite object is in the second floor, the hand axe embedded in rock dated to 1.83 million years ago created by high pressures and temperatures from the meteorite impact! I finished the museum within 20 minutes since nothing much to see. The museum has only one guard whose duty is to make sure that all guests will sign the register book. I walked to the hill behind the museum and typical to other Malaysian tourist attractions, there is an observation tower on the hill for visitors to see the sea of palm oil trees and lovely view of mountains and river. While the site’s importance is undeniable, my experience with Lenggong was quite underwhelming even I prepared to read the ICOMOS report before the visit. The planned new Lenggong Visitor Center development is very challenging with the winner’s design of bamboo loop tunnel, an impressive design that will make the future visit more interesting but for architecture not for archaeological values! I reached this site travelling by bus from Kuala Kangsar to Lenggong. From there I took a taxi to the museum. This site was the most disappointing of the three early man sites I have visited in Southeast Asia (Ban Chiang/Thailand, Sangiran/Indonesia and this one). The museum holds little of interest and the staff were disinterested. I question how this site achieved WHS status. I was able to visit this site last April 2012, prior to its inscription as a WHS. By that time, I didn't even know that it was in the T-list! In fact, Bujang Valley was more popular at that time as a contender amongst locals. Anyhow, the inscribed area is big - a bit scattered as well. Though some digs are open for visits, I never got the chance to see any of these then(at the moment, I've yet to hear a good review about these dig sites, so I guess its really nothing to feel sorry about). Nevetheless, I managed to see the museum that houses some of the findings in the area. I hope that some upgrading and modernization of the facilities in this site are on their way, though -- its really needed. For some weird reasons, I didn't see the famed Perak Man in Lenggong Valley. I saw it, however, earlier that year -- as a guest article -- in the Sabah State Museum! I think that returning the skeleton back to Lenggong would make the visit to this site more meaningful and fulfilling. Furthermore, the valley is also scenic with its limestone karst backdrops. Lenggong Museum and WHSs in the valley may not attractive in some aspects. Presentation in museum is nothing outstanding. It need much improvement. As latest WHS since 2012, government should do more thing here in near future. My Penang friend and I drove to Lenggong town and finished the museum visit within 30 min. But officer told us to hire local guide to explore the archeological sites that a few kilometres away. All sites need 4WD vehicle, due to rough road condition. I climbed 100metre high mountain to reach Perak Man cave and could not enter inside, they built metal gate and locked. Then went to other sites, all of them are empty. Some are the caves, some are the pits that completely dug by the archeologists. Lenggong town is simple and Perak river run through it. The town is approx 30km from major city and 100km away from Ipoh capital of the state. Archaeological sites are my least favourite among the WHS. Simply because a whole where the found something important still remains a whole, as usually they remove all they find from the site and stuff it into a museum. Nevertheless I drove 2.5 hours from Penang to visit the site (mostly because I got the opportunity to tick one off the list the almost nobody saw so far). The highlight of this site seems to be the museum which shows the importance of this place. It's ok, but not a big deal. Further, the Perak man is not even there, but in KL. Despite the museum, there is not much to see. You can admire a few stones and a nice view over the beautiful valley, that's it. I really hope they will upgrade the accessibility of the site, but I highly doubt this will be a highlight on the list for fellow enthusiasts. Site „visited” in August 2017. At the beginning I must warn all WHS fans – the highlight and the only place that provides any understanding of this site – Archeological Museum in Bukit Bunuh, as well as associated excavation area, is closed for renovation until further notice. Based on what I heard from the guard, the renovation works will last at least one more year. 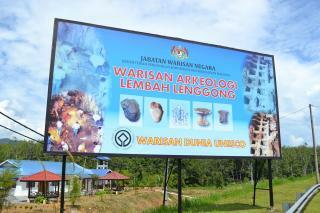 As a result, my visit was limited to the excavation area of Bukit Jawa, which is located very close to the main road no. 76. Thanks to very precise coordinates provided on this site I was able to locate Bukit Jawa without any problems – although I cannot say it was worthwhile. Bukit Jawa is literally a hole in the ground (see photo) with a short description attached informing what was excavated in that hole. I tried to locate remaining sites, but could not find any signs – but based on others' reviews, they are not spectacular, too. That being said, I think there is no sence in visiting Lenggong Valley until the museum is reopened. For me the experience was comparable to visiting (in)famous Struve Arc monuments. The site is very easily accessible with a rental car. From Penang it is less than 2 hours drive, Kuala Kangsar (with famous Sultan palace and the picturesque Ubudiah Mosque) is half and hour south. WHS fans may combine Lenggong Valley with Belum State Park, currently on Malaysian T-List, which is further north and is definitely worth visiting.